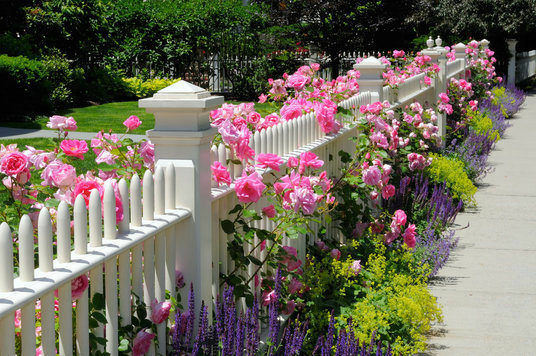 These sturdy fence posts stabilize this garden fence. Elaborate post caps add extra elegance. You may have thought a lot about what type of fencing you’d like for your residence or business. But have you considered the importance of the fence posts? Fence posts are essential for stabilizing your fence and helping it to withstand high winds and other pressure. They can also be accessorized to add more aesthetic appeal. Here are some fun facts about fence posts! Correct installation of the fence posts is key to the longevity of your fence. If the posts are uneven or weak, the entire structural stability of the fence is compromised. Not only does this not look appealing, but it’s also dangerous. This crucial step is difficult and time-consuming. It’s best to leave it up to a professional fence installer, like Hercules Fence of Richmond, to install your posts for you. An experienced contractor will set up your posts six to eight feet apart, depending on the type of fence. Additionally, strong fences, like security fences, may have extra fence posts for added stability. Decorative aluminum fences will also need extra posts to support the weight of the steel. Fence post caps are a decorative element that you can add to your fence posts that give your entire fence a finished look. You don’t necessarily need to add fence post caps to your fence, but they do offer the opportunity to boost your curb appeal as well as just have fun. Fence post caps come in a variety of shapes and sizes, including round, pointed, flat, and more. You can even use solar panel post caps to send a little free energy to your home! This entry was posted on Friday, June 10th, 2016 at 1:38 pm. Both comments and pings are currently closed.